January 25, 2013 by Venky. It was 21st Aug-2011. It was the third Sunday of the month and it was time for another BBCh race. This time, a Team Time Trial(TTT). It was happening on my regular ride route on Siva’s road starting from Budigere. I used to ride on that road quite regularly training for TFN-2011. I rode to the starting point of the race with a couple of friends- all of us very excited to watch the race. I wasn’t part of any team at that point of time and I had no intension of participating in the race as I did not consider myself fast enough. As I realized soon enough, that is hardly an excuse when it comes to BBCh. They were conducting an Individual Time Trial(ITT) for all the guys who wanted to race but didn’t have any team to ride with. I thought by signing up for participating in it, I could add some more miles to my Sunday ride and as an additional bonus I could get to watch the big boys race on the course(It was an out and back course of 22km) instead of waiting at the start/finish line to watch them finish. So, I made it to the start line with my Bulldog and had super fun riding the course and watching the big boys and their teams coming from the opposite side, blazing the road with their scorching pace. Even for my bald self, it was an hair raising experience. The Bulldog and I lining up for our first race! As if that was not awesome enough, I ended up getting my first podium finish and medal, having finished second in the ITT. Of course, all the big boys were participating in the TTT but it still felt great. By the time the new season BBCh 2012 kick started with the prologue inFeb-2012, I bought a road bike and joined Spectrum racing. The fact that the game went up by a notch at BBCh-2012 was pretty evident even with the very first race of the season. 86 people turned up for the first race of the season. A pretty daunting number for an ITT. A lot more were there to watch and support their friends too. It was just the harbinger of things to come. All the races during the season saw huge turnouts. If I was worried that the huge turnouts mean more incidents, my worries were put to rest. It is because the game was taken up a notch by the organizing team too. I was impressed with the way the organizers have taken care of the safety aspect especially in a dangerous race like Turahalli Downhill race. Thankfully, the ambulance that is always on the stand-by during the races was only needed in one or two instances throughout the season, that too for lacerations from an odd road/trail rash. Better routes were chosen with the various local teams stepping up to the plate and contributing to the race organizing effort by adopting a race each. The season saw some pretty amazing races be it the awesomefun of Turahalli DH, the great trail riding sufferfest of Sarjapur Crosscountry race, amazingly scenic and equally challenging Harohalli Jigani race or the mother of all challenges- the Nandi race. While I thoroughly enjoyed my first real season of racing, what amazed me was the kind of talent that I saw evolve during the season. It is so good to see guys becoming stronger and stronger with each race as the season progressed. Young talent like Siddarth Kansal(Veloscope), and Sarvesh Arya became strong riders that could challenge most out there. Siddarth, with his hard work and consistency, gave a real tough fight to the eventual winner of the BBCh points title, Naveen Raj(SKCT). Riders like Adarsh Sexena(MadRascals) from Chennai made people sit up and notice with their performances. I’m sure the next season would see a lot more young talent coming to the fore. Racing is not just for the younger brigade. The experienced riders like Georg Leuzinger(KYNKYNY Wheelsports) seem to suggest that age is just a number by the way they ride. It is humbling experience to see guys of all age groups and backgrounds ride together in the BBCh peloton. 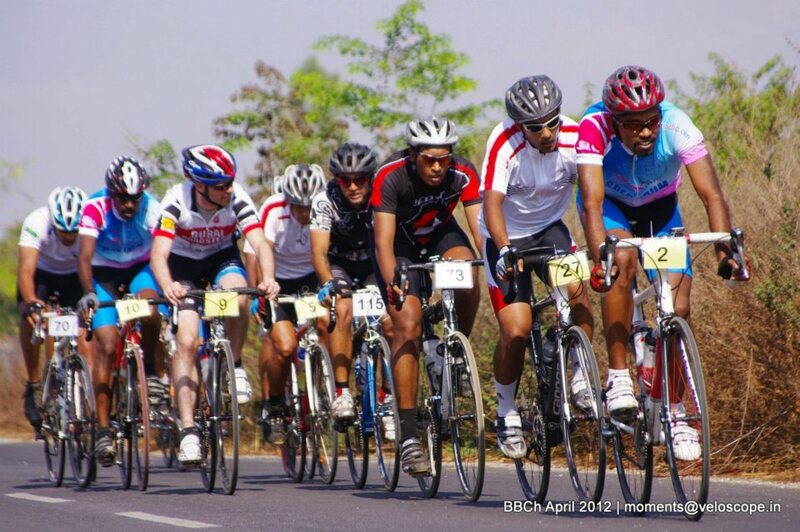 BBCh-2012, saw participation by riders from all over the country. People flew down from Delhi, Pune, Hyderabad, Chennai, Mysore, Gawahati, Chennapatna, Panaji, etc to name a few. It is not just the numbers, the level of competition went up the roof and I have a feeling that 2012 was just trailer to what is ahead at BBCh. BBCh-2012 had some great XC races too.. Specialized KYNKYNY Cycling Team’s formation and their subsequent dominant show at BBCh spurred a lot of interest from various corners of the country and I can see many such teams coming into existance and ready to rock the BBCh scene in 2013 and beyond. Names like Trek/Firefox and KHS are already flying around and I think this augers really well for the cycling scene in India. It should be a riot at BBCh-2013 with these new teams as well the existing teams local teams like SKCT, Spectrum Racing, Veloscope Racing, BOTS racing, CleatedWarriors etc. In the four years of its existence, BBCh has inspired similar racing scenes to come up in other cities like Chennai(TCC), Hyderabad(HCC), Pune and Delhi. I have heard really good things about the way races at TCC and HCC are organized. I have no doubt in my mind that BBCh has played a great part in the improvement of the overall amateur cycling scene in India that we are seeing right now. We have to thank the hundreds of volunteers from the Bangalore Bicycling Community who make Bangalore Bicycling Championships (BBCh) the number one amateur cycling championship in the country along with the awesome folks at Bums On The Saddle (BOTS) who spearhead this volunteer community effort. For me personally, BBCh gives me a reason to keep training and staying fit right through the year. It is almost like, I train because I don’t want to miss all the great action at BBCh. I cannot wait BBCh-2013 to begin.